Going solar is a big deal, both for your home, your wallet and the environment. However, there’s a difference between residential systems, and it’s important to know what being “on” or “off” the grid means for you. Here’s a quick look at grid-tied solar systems, and how they work in your home. 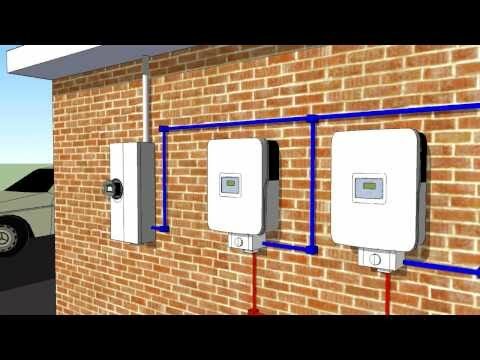 Grid-tied solar systems link directly through your meter that provides the electricity. In other words, it’s hooked up to your utility company. This grid will store the excess power your solar system produces, and add power when you need more electricity. So instead of using a battery storage system, the grid-tied system produces and stores solar power. During a major storm, power outage or some other safety issue, grid-tied solar PV systems automatically shut down. Some systems include battery backups, but it’ll increase the cost of installation while decreasing overall performance efficiency. Another option is to invest in a generator. That said, depending on where you live, the moments where you’d need this are few and far between. If you’re afraid this could be an issue, look into battery or backup energy alternatives in case of an emergency. How Much Do Grid-Tied Systems Cost? Your total cost for the project is going to vary on a lot of factors, like its size, how you mount it, and other installation issues. That said, between rebates, federal tax credits, and the lowering cost of solar power overall, investing in a grid-tied solar system is the cheapest it’s been and you’ll also see some significant savings in the long term. Is your residential solar system on the grid or off the grid?